The efficient utilization of sunlight as a carbon-neutral, renewable energy source remains a challenge for scientists across many disciplines. The enormous scope of solar energy conversion on a global scale requires the development of photoactive materials from readily available and economically viable resources. Photoluminescent complexes based on earth-abundant early transition metals or main group elements present an attractive low-cost, low-toxicity alternative to precious metal photosensitizers commonly used in photochemical processes and solar energy conversion. However, the fundamentally different electronic structures of these elements requires the development of new approaches to light-induced charge separation and electron transfer. 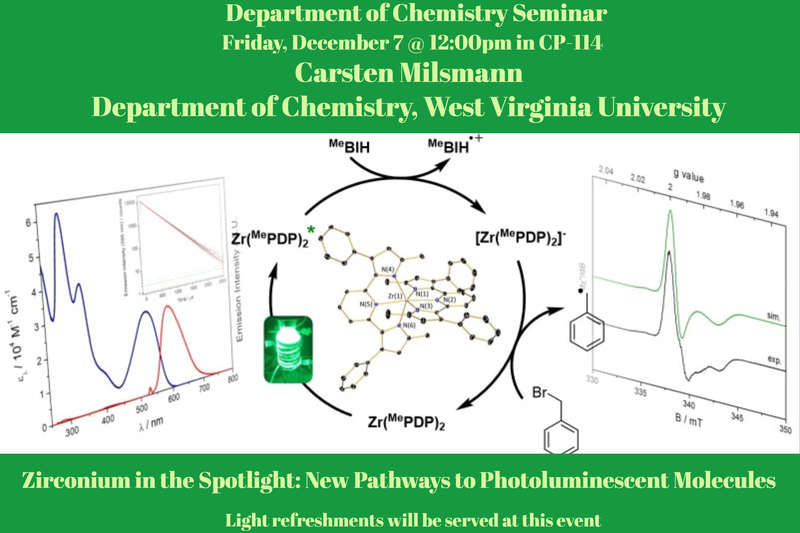 This presentation will highlight the Milsmann group’s efforts to establish design principles for the generation of luminescent early transition metal complexes that can undergo photo-induced single electron transfer (SET) reactions upon irradiation with visible light. A particular focus will be on phosphorescent zirconium complexes that exhibit exceptionally long triplet excited state lifetimes. Our results show that these complexes can not only replace precious metal photosensitizers in photoredox catalytic reactions, but may exhibit optical properties that complement those of traditional late metal compounds. In addition, research towards the development of metal-free phosphorescent molecules based on silicon will be discussed.